We say goodbye to May 2015 with the familiar - relaxing yet stimulating - late-night mix: Max Richter (see video), playing piano; Loudon Wainwright, bemoaning the wife of a friend; Gerry Mulligan teamed up with Johnny Hodges; there's piano music by Ravel, Rachmaninov and Rautavaara; Clifford Brown with strings; singer-songwriter Jackie Oates; the late Montserrat Figueras, and something originating from 12th century France; another selection from "Dallendyshe"; Christy Moore sings a Philip Chevron creation; and we listen to a choral work by Stanford. Eamonn presents part of Michael Nyman's Symphony No.11 (Hillsborough Memorial); Joe Albany's reading of "As Time Goes By" (Albany played piano for Charlie Parker in the 1940s); a selection from "The Murphy Beds", a recording by Eamon O'Leary and Jefferson Hamer (see video); music for solo piano by Australian composer Kate Moore; Estonian jazz courtesy of Mart Soo; Ben and his dad Tom Paley from "Paley & Son" (Tom played with Woody Guthrie and mentored Bob Dylan and Ry Cooder, amongst others); Samuel Barber's Op.38, performed by Keith Jarrett; also on Saturday's BLUE, more from Elina Duni's "Dallendyshe"; and Courtney Pine, from his new duet CD with pianist Zoe Rahman. Tonight, Eamonn presents the Irish Youth Chamber Choir, from its 2015 debut release (an EP); a solo piano improvisation by the young American musician Aaron Parks who, at age 15, was majoring in music, math and computer science at the University of Washington; English composer Laura Rossi remembers our dead ancestors (specifically those killed in World War I); bandoneon-player Dino Saluzzi is heard with his "family band"; two Irish-American sisters sing an ode to mothers; we'll also hear a 2015 release by Olga Georgievskaya (whose sister is also a professional classical pianist); jazz piano-man Kenny Werner (see video), from a forthcoming CD; new Andy Sheppard; symphonic Shostakovich; and another selection from "Dallendyshe". 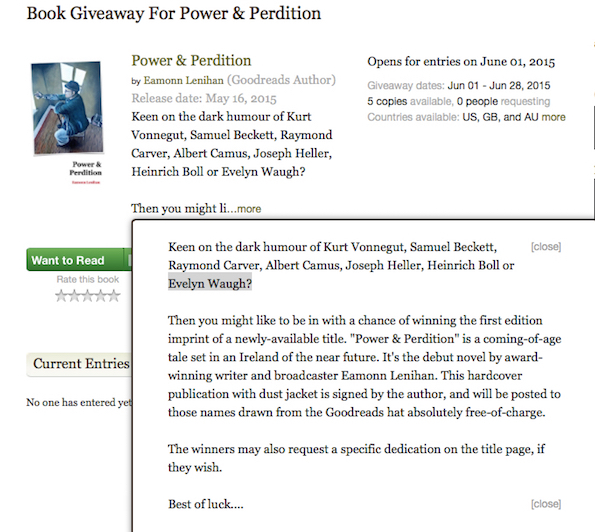 Five free copies of "Power & Perdition" will be up for grabs at goodreads.com for most of the month of June. The latest recording by Trio Mediaeval (see video) is a collection of polyphony from Iceland to Italy; it's named "Aquilonis", in honour of the North Wind. Hear a selection from the CD on tonight's BLUE. We'll also listen to 3 samples of contemporary jazz from Estonia; the father and son pairing of Tom and Ben Paley; Argentinian guitarist Pablo Márquez; young jazz pianist Gwilym Simcock (who'll be teaching and performing in Sligo this summer); more from the pen of Bob Dylan; solo piano music by Arnold Schoenberg; and American sax-player Harry Allen, recorded in the company of the Jan Lundgren Quartet.